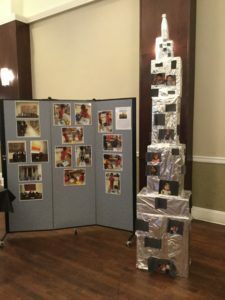 76 Pre-K 1 created a replica of the Empire State Building for their New York City-themed book study. Families observing the Pre-K 3 exhibit at the 76th Street Museum Night. 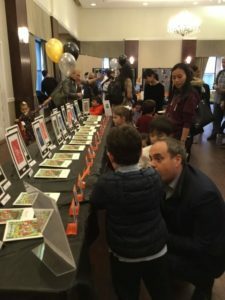 On Tuesday, April 9th, The International Preschools’ 76th Street location hosted its second annual Museum Night for the Green Rooms (3s) and Pre-Kindergarten classes (4s). Museum Night first took place in 2018, as a Green Room function. Families were invited to observe artwork, photos, and other projects created during each class’ curriculum theme. Pizza was served and children were invited to dress up for this special evening celebration! This year, our Pre-K classes joined the Green Rooms in displaying work from their winter author and book studies. Read on to find out more about this special event! Creating a flag collage in honor of United Nations Day. Each year, the faculty, staff, parents, and children of The International Preschools come together to celebrate a special holiday: United Nations Day. More than 50 years ago, The International Preschools was created as a way to assist international families who relocated to the United States. Formerly known as The International Play Group, the school opened locations throughout Manhattan and Queens. Today, we celebrate United Nations Day as a way to commemorate IPS’ inception and to introduce our students and families to the many cultures that make up our school community. 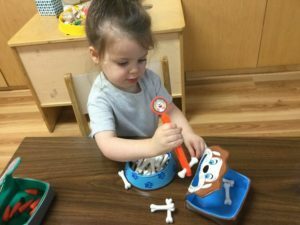 A child works on her pincer grip while engaged in a game called “Feed the Dog.” Here, she will strengthen her hand muscles for future writing endeavors…all while learning through play! 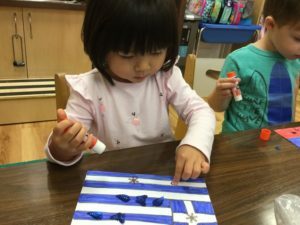 Each year, The International Preschools invites parents to a fun and educational Curriculum Night during the early fall. The purpose of this evening is to teach parents the important aspects of the school day, including IPS teaching philosophies, topics of study, daily schedules and routines, and upcoming events throughout the school year, as well as answer any questions that parents have about their child’s school day. This year, on Wednesday, October 17th, parents at our 45th Street, 76th Street, and 86th Street locations will visit their child(ren)’s classrooms to learn about the school day from two points of view: the teachers and the students! Our youngest students hard at work! The children here are bolstering a variety of skills while at the play dough table: strengthening their hands for future writing activities; learning to share tools; engaging in both parallel and cooperative play; and working on expressive and receptive language skills…just to name a few! A friend of mine recently attended the parent/teacher conference for his eighteen-month-old son. Prior to the meeting, he questioned the importance of attending a conference for a child so young. What would the teachers possibly have to say about his son, he asked? After attending the conference, he had an answer: a lot! Separation Anxiety: It Can Happen to Anyone! Toddlers lining up to play on the first days of school! The children’s book, Wemberly Worried by Kevin Henkes, tells the story of a child named Wemberly who worries about everything. Her biggest worry of all? The first day of school! Ultimately, Wemberly vows not to worry so much in the future, so that she won’t miss out on the fun. Like Wemberly, separation anxiety is a natural thing for children (and parents) to feel during the first days of school. Some children transition easily into school right away, saying goodbye to their parents without ever turning back. Others might start on day one, excited and enthusiastic, and return on day two hesitantly and apprehensively; this often occurs when a child realizes that school doesn’t occur just one day a year! And still, other children take days or weeks to warm up to their new school environment. Rest assured, this behavior is to be expected, and the teachers and staff at The International Preschools are ready to help!